Have you noticed the number of painters dotting the landscape around Laguna Beach this week? If so, then you’ve seen some of the finest plein air painters in the nation practicing their art. Laguna Beach has once again hosted the Plein Air Painting Invitational, going strong now for 19 years. 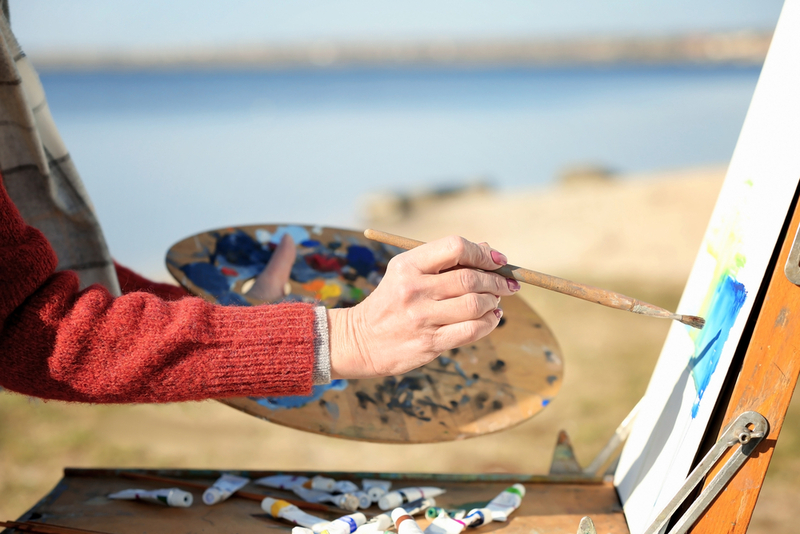 Plein air painting is the practice of taking your easel outdoors to paint. The term “plein air” means “open air” in French. It has been used since the time of Claude Monet to describe the practice of painting outside. Plein air is a form of painting that allows artists to be outside and experience nature, letting all their senses engage with their subject. Moreover, many believe that painting outdoors allows them to better represent the color and light of the landscape and capture its true essence. When did plein air painting come to Laguna Beach? Take a look around outside – it’s no wonder plein air painters have long loved Laguna Beach. With our warm climate and abundance of gorgeous natural scenery, there’s no end to the possible subjects for a landscape painting. Plein air painters first discovered Laguna Beach in the late 1880s. They prized the area for its clear light and natural beauty, and wanted to capture it on canvas. Some of the early Laguna Beach plein air painters included Frank Cuprien, Edgar Payne and William Wendt. These artists together with others would ultimately become the founders of the California Impressionist Style. In 1918, these artists formed the Laguna Beach Art Association, and the city soon became known as an artists’ colony. Over the years, the city’s reputation in the art world grew and attracted more noted artists like Benjamin Brown and Guy Rose. In 1929, the group opened a permanent gallery on the corner of Coast Highway and Cliff Drive. That gallery is known today as the Laguna Art Museum. How can plein air painting be experienced in Laguna Beach? Laguna Beach artists formed the Laguna Plein Air Painter’s Association (LPAPA) in 1996 to preserve the area’s legacy in this art form. The organization helps to support the tradition as well as plein air painters across the country. They created The Plein Air Project to teach multiple generations about plein air painting. In addition, they host Plein Talks and PaintOuts for plein air painters, suitable for those just starting out and those who have been painting for years. Perhaps their most famous event is the Laguna Beach Plein Air Painting Invitational. The event transforms the town into an outdoor painting studio and attracts painters from all over the country. 35 of the best artists compete for prizes, and festivities take place over a week. The community can get involved with educational programs and paint outs, particularly suitable for area youth. The week is capped off with the Collector’s Soiree and an Art Show. Both are excellent events to enjoy the natural beauty of Laguna Beach and browse some of the finest plein air paintings available. If you’d like more information about buying or selling a luxury home in Laguna Beach, please click here or call 949-689-9047 to talk with John Stanaland.